If Dai Woodham’s means nothing to you, then either skip this blog which, perhaps, gets to the heart of nerdism – or read on and learn that in the end the heritage tourist business owes a huge debt to Dai Woodham, scrap merchant of Barry Island in South Wales. In the mid-1960s steam locomotives were being swept out of railway service at an incredibly fast rate. The railway works could not dispose of these big hunks of metal fast enough so many were sold to private scrap metal merchants – amongst them Dai Woodham. For some reason, Dai dealt with the locos very slowly. The argument seemed to be that other items could be cut down for scrap more quickly. A huge number of locos just stood, slowly rusting, on the Woodham sidings at Barry. As early as 1968, preservationists realised that Dai had a wonderful collection – and that if money could be raised to buy them, his locos had potential. The Keighley and Worth Valley Railway were able to purchase a loco and this was the start of a slow exodus from Barry. My opportunity to visit Barry came in the spring of 1982 by which time no less than 139 locos had been bought, mostly for preservation but some to provide spare parts. The yard did not seem empty. I was still using colour slide film at the time with my trusty Canon demi camera which took 72 half sized slides on a 36 exposure film. When I first made copies, I could only get small images like this one. 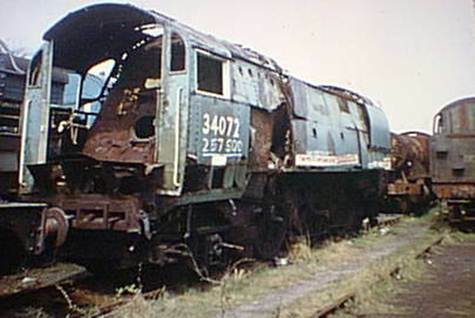 Enough to make grown men weep – the seemingly wasted hulk of a big steam loco. Yes, I joined the grown men wandering these sad sidings. Many men were actually crying. This was easily recognisable as a Battle of Britain Class of the Southern Railway. She became the 158th engine to leave Barry, in November 1984. By 1987 she was back in service on preserved railways. More recently I’ve been able to get bigger copies, but of course, my original slides are just 24mm by 18. (And blogs limit the size anyway). Dai Woodham’s sidings in 1982. How sad it looked but how happy the outcome. The engine on the right – a big GWR 2-8-0 tank left Barry in 1987, the 190th engine to leave. 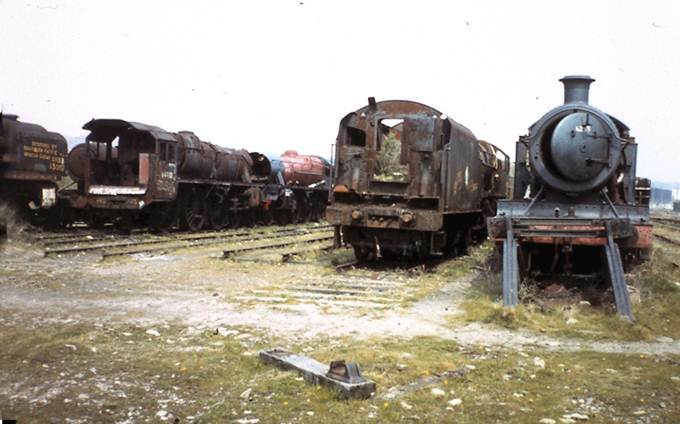 Over on the left there’s a Bullied pacific and a Stanier black 5. I really can’t over emphasise the mournful attitude of the middle-aged men roaming Dai’s sidings that day. Yet really, it should have been smiles. These engines were all saved. This entry was posted on November 11, 2012 at 6:43 am and is filed under railway, Travel. You can follow any responses to this entry through the RSS 2.0 feed. You can leave a response, or trackback from your own site.